It’s so annoying when you develop a “thing” about a style/color/pattern and don’t wear it because that “thing” sticks in your head. 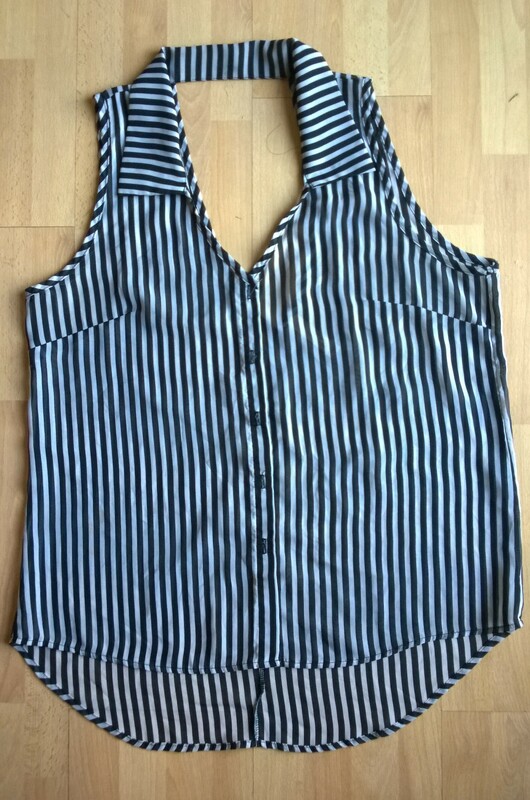 I bought a cute black and white vertical striped tank, put it on, and my son smiled and said “Are you going to referee a game today?” Aaarrghh…now all I can see is an umpire every time I put it on! I even tried dyeing it bright pink and black, but the fabric didn’t hold the dye. It’s now been relegated to the sleepwear division. 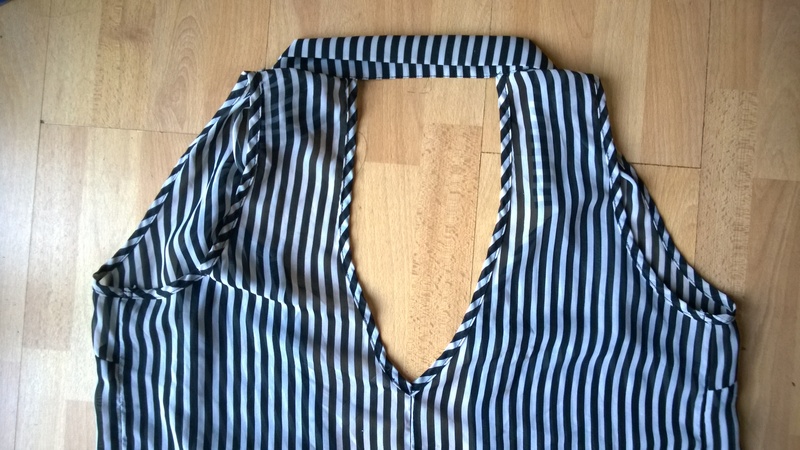 I still love those stripes (on other people), so when I got given a pile of unwanted clothes, I was happy, and sad, to see a striped blouse. 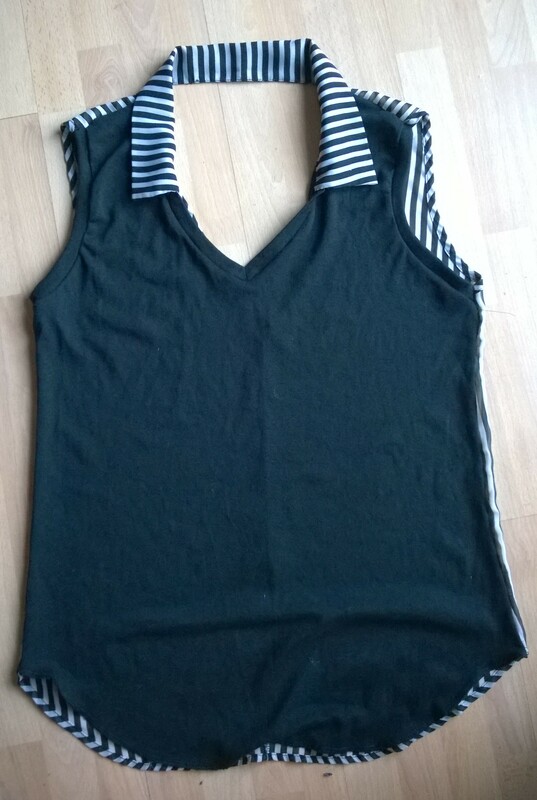 It was a great style, with an open V-neck at the back. I tried it on, hoping I could get over my stigma, but nope! Also, in the pile was an unworn black T-shirt. It was nice and long with a V-neck. What to do, what to do……?? OK, time for some inspiring, lighthearted music……The Wombats – A Guide to Love, Loss & Desperation (LOVE the stripes, LOST the confidence to wear them, DESPERATE to make them work). That’s when I decided I could handle being a ref from behind! 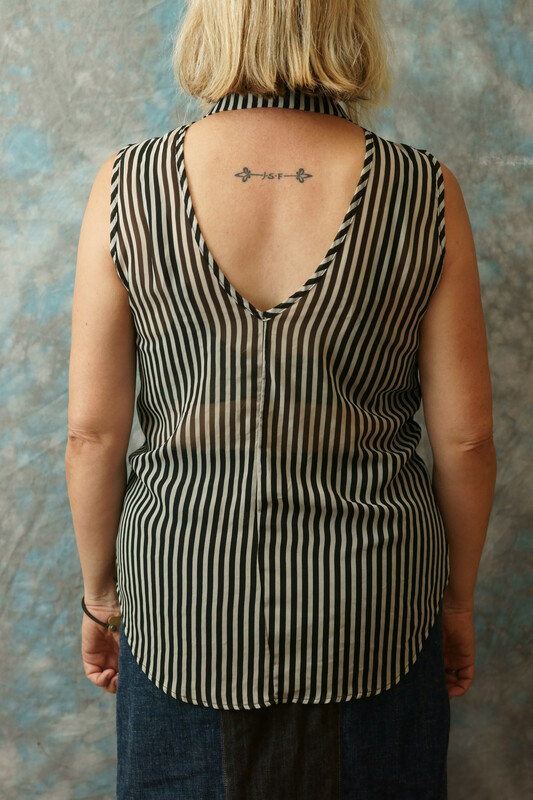 I separated the backs and fronts of each garment, keeping the blouse collar intact. Then I stitched them together. It pulls on easily because the front is jersey, so no need for buttons. Posted in Uncategorized and tagged referee shirt, umpire shirt. Bookmark the permalink.